Phuket, 25 February 2016 – Representatives of Amari Phuket, Richard Marco, Hotel Manager (second from right), Chonnanan Prakarn, Director, Human Resources (right) and Suchada Thongkum, Team Member, Human Resources (left) recently visited Patong Hospital to donate the funds received from the World Cancer Day Project to Dr. Sirichai Silapa-archa, Patong Hospital Director (second from left). 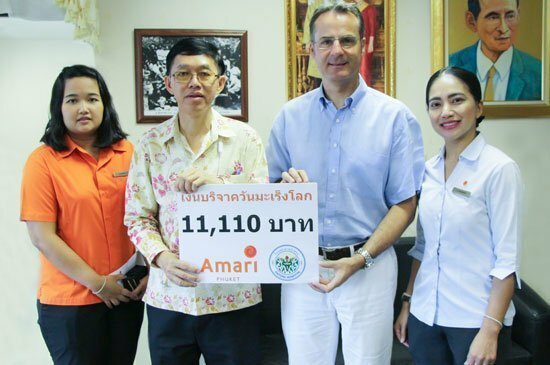 Amari Phuket’s entire team worked together to raise the project fund successfully. The fund will be used in hospital operations to help cancer patients.